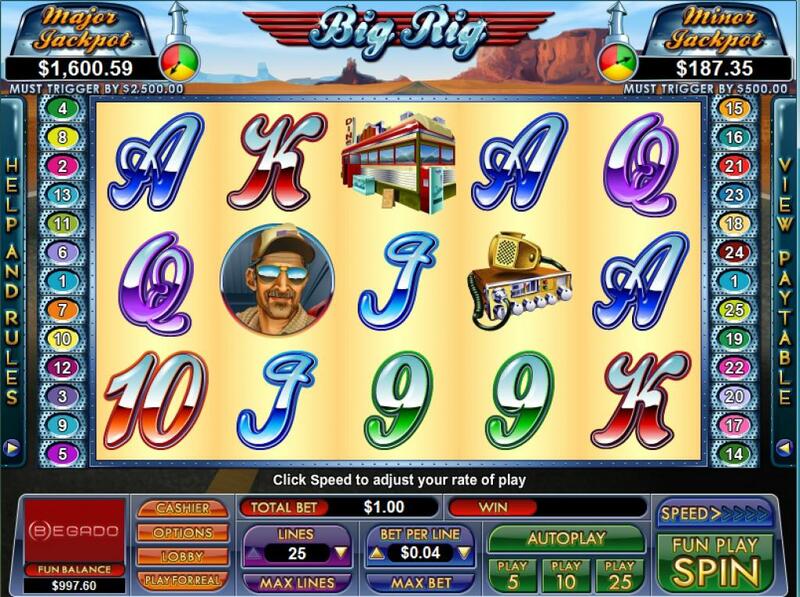 Big Rig is a trucker’s dream, a slot machine dedicated to the drivers that explore America’s roads, driving big rigs, eating at diners, talking with others via radios. These are also a couple of the symbols which are shown on the reels, revealing things that are part of a trucker’s daily life. You see the open road in the background, an appropriate image for this theme. While a theme that many will enjoy seeing, and in a game with better than average features, you will notice that there are a few too many symbols without a connection to this topic. The standard 5 reels and 25 paylines are used by Big Rig, a very common choice for Nuworks. 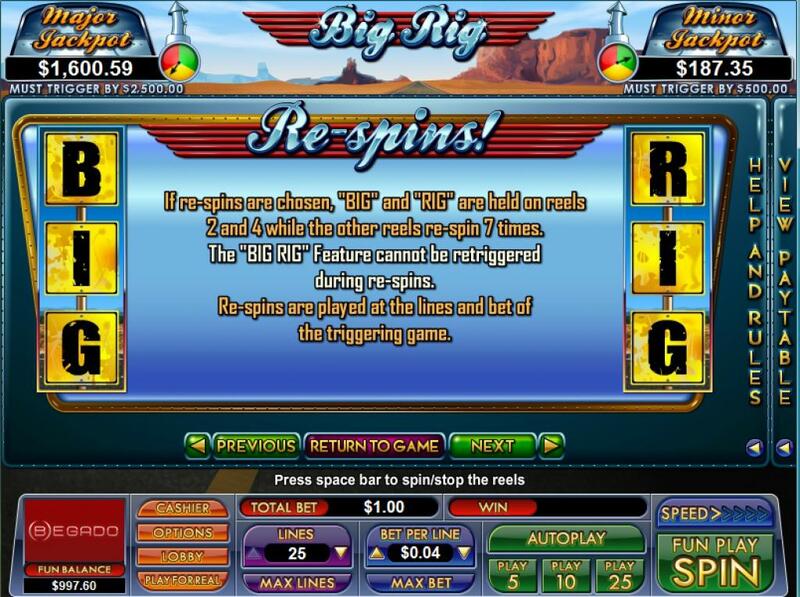 Free spins, re-spins, multipliers, stacked wilds and scatters make-up the complete list of features. $5,000 is the best prize offered. 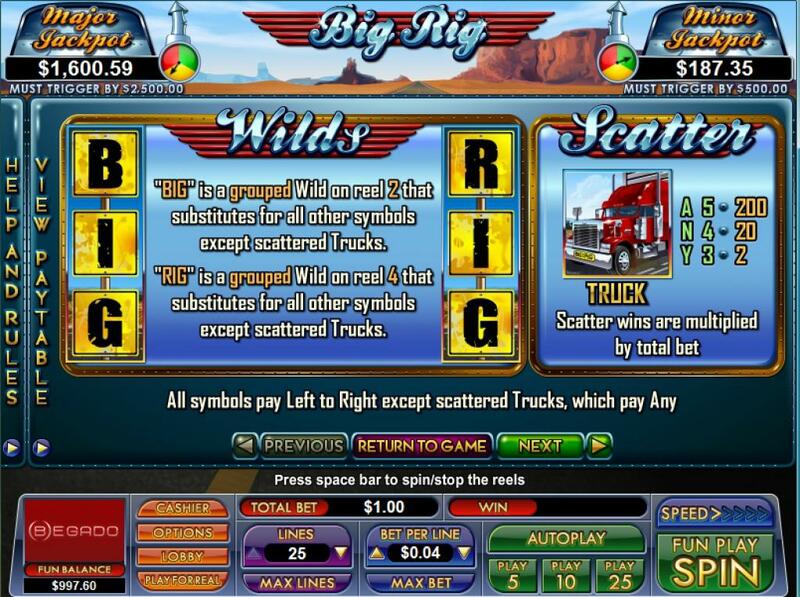 The presence of stacked wilds in the game will not go unnoticed, and the same goes for the Truck scatter symbols, the re-spins and the free spins with multipliers. The game has two different stacked wilds, but they both work the same way. One has the letters BIG on the three symbols that are in the stack, and it’s present on the 2nd reel. The other wild has RIG written on the three symbols of the stack, each letter on a different position. The second wild is used on the 4th reel. With the exception of the scattered Truck, all other icons can be replaced with a wild in a newly formed combo. Speaking of the Truck scatter, this symbol doesn’t have any reels on which it can make an appearance. 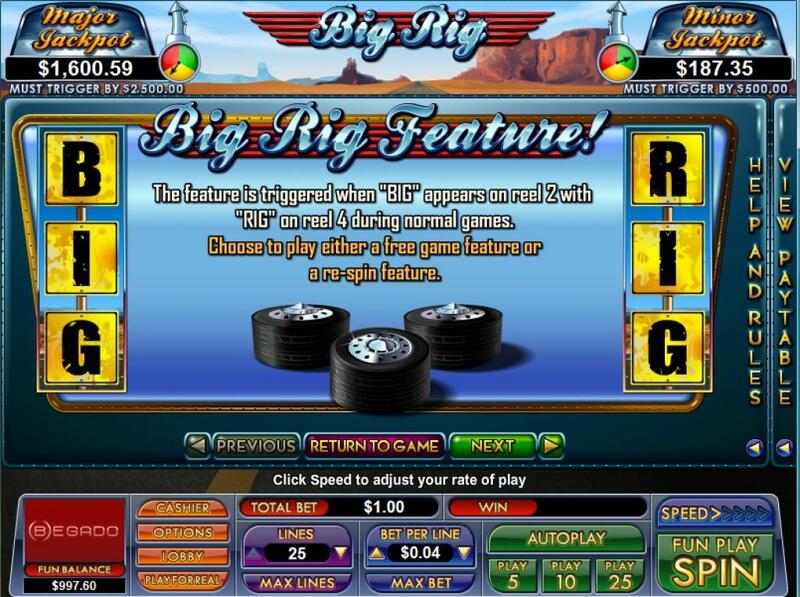 It offers prizes that start at 2x and can reach 200x the bet, depending on how many Trucks are on the reels in the same round. 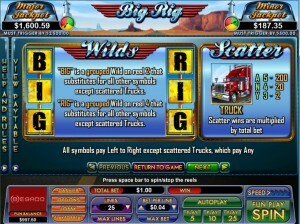 To trigger the bonus game of Big Rig, the requirement is for both stacked wilds to be visible on the reels on which they can appear (2nd and 4th). 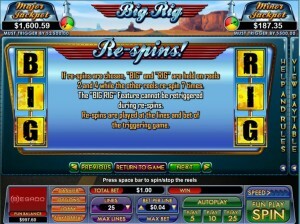 When this happens, you get a choice, to play either the feature with re-spins, or the one with free spins. 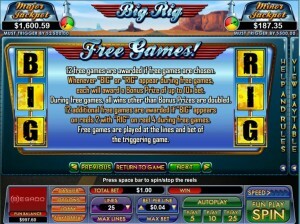 If chosen, this feature will give you 12 free spins to play through. 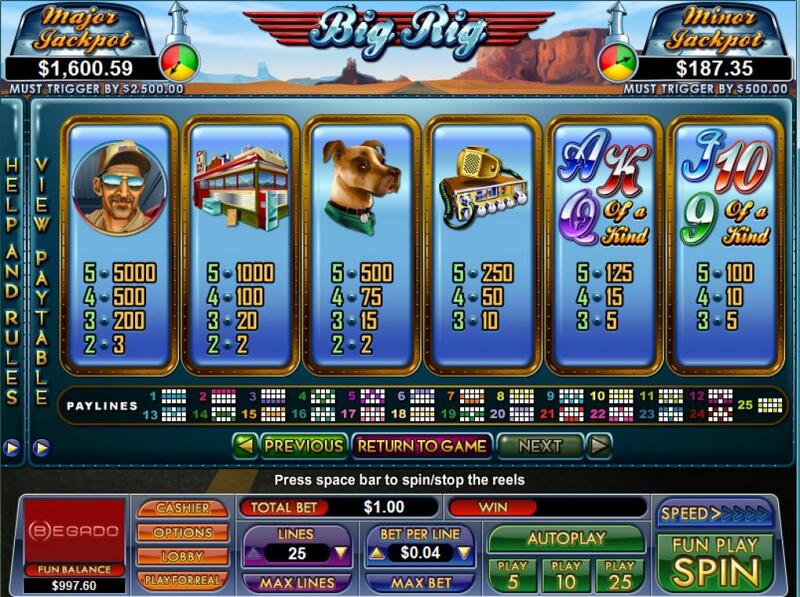 Getting one of the two stacked wilds during these free spins will trigger a bonus prize of up to 10x the bet. 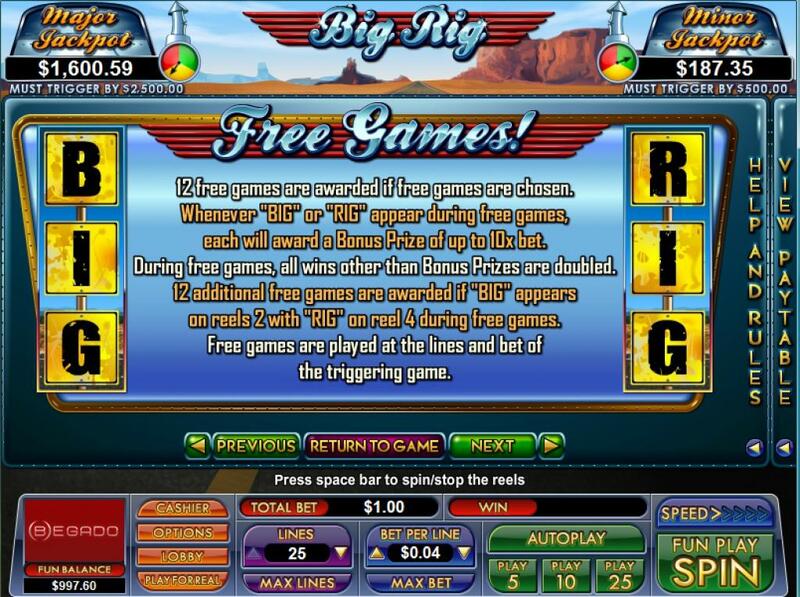 All wins obtained through regular combinations are doubled while the free spins are in use. If you get the two wilds on both the 2nd and the 4th reels at the same time, the free spins are retriggered, with another 12 rounds. If you’ve went with the re-spins option, you will find that the 2nd and the 4th reels will hold the stacked wilds in position, while the other three reels will re-spin a total of 7 times. This is not a feature that you can retrigger. You may place a bet of up to 25 coins on each spin, knowing that for each coin you get one active line and one extra chance to form a combo. The coins are all of the same value, which you choose, between $0.01 and $1. The largest wager possible is worth $25. 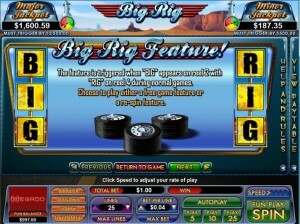 You can win 5,000 coins while playing Big Rig, in two ways. Either the Truck Driver can form a combo of five symbols, or you can get five scattered Trucks (200x the bet). The maximum prize in both cases is $5,000. The part of the design that covers the open road, and the one where you get to see various things that are part of a big rig driver’s life, these are elements that deserve to be in this game, and which look good and appealing. The downside is the presence of six poker cards, which pay the least, so they are much more often seen than the five themed icons which are also part of the paytable. 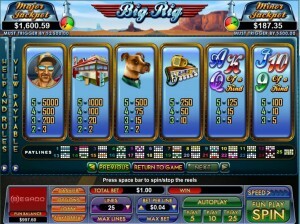 Symbols: Big (wild), Rig (wild), Truck (scatter, 200x bet), Truck Driver (5,000 coins), Diner (1,000 coins), Dog (500 coins), Radio (250 coins), Ace (125 coins), King (125 coins), Queen (125 coins), Jack (100 coins), 10 (100 coins) and 9 (100 coins). The theme might not be a favorite of a lot of people, the prizes are average and the design would fall into the same category, but the features are at least interesting, and they might convince you where the others would probably fail. 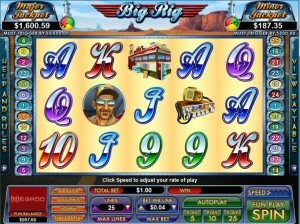 Big Rig can be found at any NuWorks casino, where you get a chance to play it for real money or in free mode.